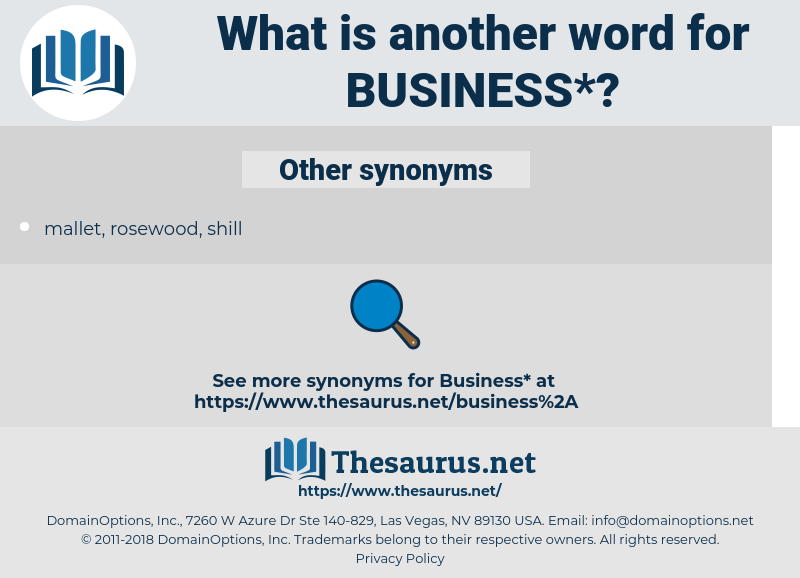 What is another word for business? Employment; occupation; trade; profession; concerns or affairs; duty; a matter. agreements, requirements, deliberations, procedures, practitioners, experiences, Measures, dealers, topics, competencies, Incentives, councils, exhibitors, aims, supplies, aspects, Workmen, features, PROSPECTS, Trustees, frames, Les, tools, cots, auditors, Its, Territories, company, Companies. Institutes, data, Les, company, stuff, bankruptcy. businesswomen, manufacturers, enterprise, enterprises, endeavours, traders, commercial, Vendors, holdings, operations, businessmen, Entrepreneurship, corporate, industry, Industries, undertaking, Undertakings, entrepreneurial, commerce, operational, affairs, trading, firm, Firms. 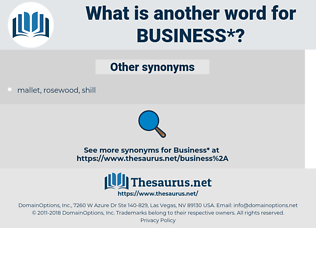 businesswomen, businesspeople, enterprise, enterprises, business-to-business, commercial, Entrepreneurship, industry, undertaking, Undertakings, endeavour, commerce, operational, trading, turnover, firm, bargain. recreation, amusement, pastime, unemployment, entertainment, hobby, surrender, fun, avocation. reliability, steadfastness, loyalty, safeguard, devotion, fealty, trustworthiness, allegiance, dependability, fidelity, protection, staunchness, faithfulness, defense, shield. processor, carrier, underperformer, brokerage, common carrier, firm, shipbuilder, maker, house, agency, partnership, business firm, dealership, franchise, manufacturing business, manufacturer, chain. target, aim, concern, worry, headache, objective, object, vexation.